Boston Mayor Marty Walsh, who has long seemed in thrall to the Boston 2024 Olympic bid, said at a press conference this morning that he refuses “to mortgage the future of the city away.” He added, “I will not sign a document that puts one penny of taxpayers’ money on the line for Olympics cost overruns,” according to The Boston Business Journal. According to other news reports, the U.S. Olympic Committee has been pressuring the Mayor to sign on to the requirement that the city backstop Olympic cost overruns, and to do so immediately. Walsh refused to be pressured. Some analysts are predicting that this stance by the Mayor will be the death knell of the current Olympics bid. If so, here’s a modest proposal. Boston 2024, including some of the metropolitan area’s most powerful business leaders, has routinely pitched bringing the 2024 summer Olympics here on the basis of what it can do to help the infrastructure, create jobs and housing, and meet other community needs. But they have been putting the cart before the horse, prioritizing Olympics-centered improvements before the city has a comprehensive strategic plan. This entry was posted in Politics, Uncategorized and tagged Boston 2024, Boston mayor Marty Walsh, Governor Charlie Baker, No Boston Olympics, no guarantee for Olympic bid, no taxpayer money for 2024, U.S. Olympic Committee. Bookmark the permalink. 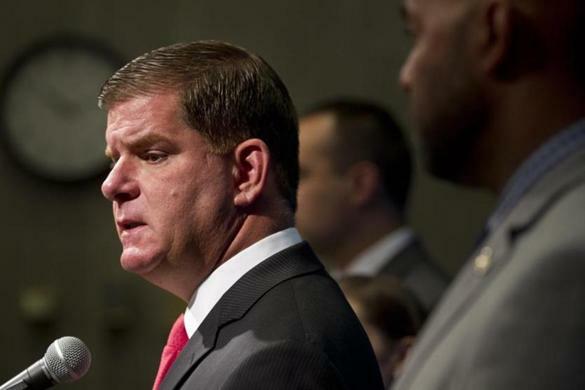 4 Responses to Walsh stands tall: now how about Boston 2030? I too hope that all sides will come together to effect the improvements, major and minor, that we have all known for years are needed. I’m afraid that I have a couple of quibbles, however. Even though the finances were obviously the overwhelming concern, I hope that, now, Mayor Marty is, now, aware that there were major concerns also about the clear evidence that the people behind Boston 2024 were really interested in the land grab and tax scam and using the Olympics as camouflage and also about disruption and the, umm, massive amounts of wishful thinking and exaggeration put forth. As a native Bostonian I am glad for many reasons that Boston 2024 is no more (although I would be surprised if the cabal gives up their desire for the landgrab). Both financially and as the herd of elephants in the room, it would have been a major distraction and disruption for Boston 2030, a far more valuable endeavor — at least for people who actually live here. With the bid over, let’s hope the ability to raise cash of the Boston 2024 people can be deployed to plan a better future for the Commonwealth. Great article Marjorie. Marty Walsh did the right thing in refusing to sign the agreement. Let the business leaders come forward and make the infrastructure improvements before considering an Olympic bid.